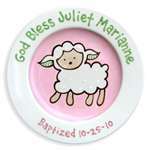 Your child’s baptism is an incredibly special day to commemorate, so make it one to remember with personalized baby baptism gifts, such as baptism plates completely made-to-order with your little one’s name and date of baptism. Christening favors are timeless, physical reminders and tokens of a meaningful day you and your child would love to remember forever. 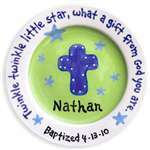 These baby baptism plates come outfitted with adorable, hand painted pictures of crosses, stars and lambs, with handwritten quotes like “Twinkle twinkle little star, what a gift from God you are” and “God bless” surrounding them. These personalized baby baptism gifts can be used as decoration or for completely functional purposes like utilizing during mealtime. Just picture your children’s faces, in years to come, when they realize they have such a thoughtful, tangible memory at hand. Tiny Keepsakes takes immense satisfaction in providing our customers with high quality, handcrafted products, like our baby christening gifts and baptism plates, that are designed with children in mind. With kids growing up so fast, we love offering our customers personalized mementos that have the ability to hold memories of special occasions and their growth in general. Along with our personalized baby baptism gifts, we also have an impressive variety of other products such as puzzle step stools, exciting story books and decorative growth charts for girls and boys. If you have any questions regarding our products or your customizing needs, please call us at 888.320.3080 or email us at customerservice@tinykeepsakes.com. For returning customers, we have an exclusive customer loyalty program that saves you money on future purchases. And for our new customers, enter the promo code, ‘STEP’, and receive a 5% off discount on your order today!